U.S. oil reserves posted their biggest gain ever in 2011, largely thanks to the controversial hydraulic fracturing production technique, according to a new report. The country had 29 billion barrels of "proved reserves" in 2011, a 15% increase from the 25 billion barrels in 2010, the Energy Information Administration said Thursday. It was the third year in a row that the United States posted such an increase, and it's the highest amount of this oil the country has had since 1985. Not surprisingly, much of the increase comes in states seeing a boom in oil drilling and production. Texas, with Eagle Ford and other shales, posted the largest increase. North Dakota was second with its Bakken Shale. Other areas showing large increases include much of the Rocky Mountains, the Appalachian states that lie atop the Marcellus Shale, California and the Gulf of Mexico. The growth in oil reserves comes after years of stagnant or declining numbers. Hydraulic fracturing, or fracking, is largely responsible, as are advances that allow drilling great distances horizontally underground. Fracking uses water, sand and chemicals to crack shale rock deep beneath the surface, releasing oil and gas that was previously inaccessible. It's unleashed an energy boom in this country, but also led to fears that it is contaminating the ground water, among other concerns. Reserves of natural gas also increased, especially in Pennsylvania and Texas. Proved reserves are volumes of oil or gas that are almost certain to be economically recoverable at current prices using current technology. It's the number the Securities and Exchange Commission allows oil companies to book as assets on their balance sheet. It's far different from other estimates that are sometimes quoted, such as "resources in place." Those estimates describe what might be possible if money were no object and the necessary technology existed to get at the oil. Those estimates sometimes show the United States and Canada holding more oil than countries like Saudi Arabia. 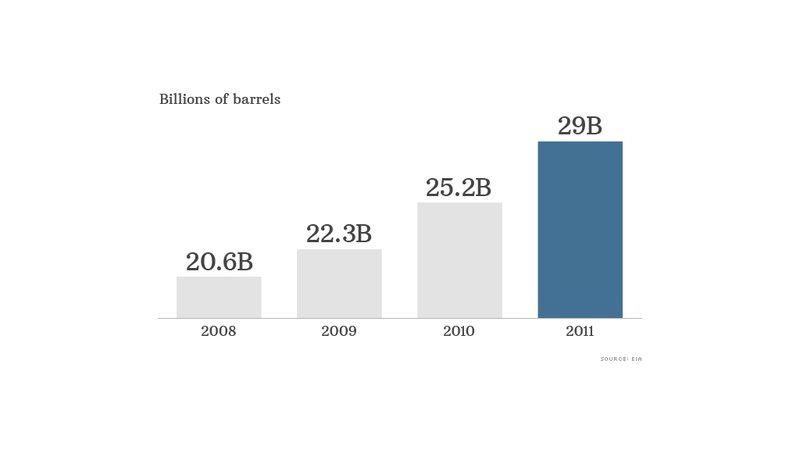 Using proved reserves as a benchmark, the United States, with its 29 billion barrels, ranks twelfth in the world. Venezuela (298 billion barrels), Saudi Arabia (268 billion), Canada (173 billion), Iran (155 billion) and Iraq (141 billion) make up the top five, according to data from the Oil and Gas Journal. EIA is reporting 2011 numbers due to budget cuts, which caused it to fall behind in its calculations.